Edwin Howard Armstrong (December 18, 1890 – January 31, 1954) was an American electrical engineer and inventor. Armstrong was the inventor of modern frequency modulation (FM) radio. Edwin Howard Armstrong was born in New York City, New York, in 1890. He studied at Columbia University and later became a professor there. He invented the regenerative circuit while he was an undergraduate and patented it in 1914, the super-regenerative circuit (patented 1922), and the superheterodyne receiver (patented 1918). 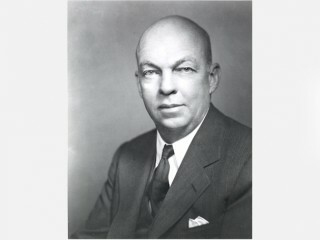 Edwin H. Armstrong is widely regarded as one of the foremost contributors to the field of radio-electronics. Radio’s premier inventor, Edwin H. Armstrong was responsible for the Regenerative Circuit (1912), the Superheterodyne Circuit (1918), the Superregenerative Circuit (1922) and the complete frequency-modulation radio broadcasting system (1933). These basic electronic circuits are underlying all modern radio, radar, and television. Armstrong was the holder of 42 patents for inventions in the field of radio. His inventions and developments form the backbone of Radio Communications as we know it. Edwin H. Armstrong was born on December 18, 1890, in New York City, where he was to spend much of his professional career. Armstrong was from a genteel, devoutly Presbyterian family of Manhattan. He was the first child in the family. His mother, Emily Smith Armstrong, had been a teacher in the public schools and his father, John Armstrong, was vice president of the United States branch of the Oxford University Press. The family soon moved to the suburban town of Yonkers, N.Y., where they lived in a house on a bluff overlooking the Hudson River. The house, which still stands just up from the Greystone railroad station, was declared a historical landmark in 1978 by the Yonkers Historical Society. Next door, on the north side of the house at the corner of Odell Avenue, was 1040 Warburton Avenue, the home of Armstrong’s maternal grandparents. The members of the two families were a gregarious lot, and Edwin’s childhood was a happy one filled with large gatherings of relatives, many of whom were teachers. Learning was prized. “Quick, boy! How much is nine times five, minus three, divided by six, times two, plus nine?” His great uncle, Charles Hartman, principal of New York City Public School 160 would quiz his nephew to encourage his mental agility. Armstrong was a shy boy interested from childhood in engines, railway trains, and all mechanical contraptions. Armstrong decided to become an inventor when he was fourteen and began filling his bedroom with a clutter of homemade wireless gear. His imagination was fired by the Boy’s Book of Inventions and by Guglielmo Marconi, who a few years before had sent the first wireless signals across the Atlantic. But wireless telegraphy was still in a primitive state. Its crude spark-gap transmitters produced electromagnetic wave signals so weak that sunlight washed them out through most daytime hours, while its iron-filing or magnetic receivers were cruder still, requiring tight earphones and quiet rooms to catch the faint Morse code signals that were all the early wireless was capable of transmitting. Armstrong joined in the hunt for improved instruments. Armstrong built a maze of wireless apparatus in his family’s attic and began the solitary, secretive work that absorbed his life. Except for a passion for tennis and, later, for fast motor cars, he developed no other significant interests. Armstrong explored many paths in his attempts to strengthen the sound. Reaching up into the air to better catch the broadcast signals, he flew from the upper stories of 1032 large antenna kites which he had built with the help of his Yonkers friend, Bill Russell. He built a 125-foot antenna pole, the tallest in the area, in the south yard. His younger sister, Edith (“Cricket”), helped in the construction, holding the guy wires and handing him buckets of paint as he swung aloft in a boatswain’s chair. Neighbors watched with awe and apprehension. His mother, however, had complete faith in her son. When a neighbor telephoned to say that Howard was at the top of the pole and it made her nervous to watch, “Don’t look, then,” was her reply. He worked with every new device that came along, but none of the instruments were able to amplify weak signals at the receiver, nor yet to provide stronger, more reliable power at the transmitter. Howard attended Public School 6 in Yonkers and Yonkers High School (1905-1910). On graduating from high school, Armstrong began to commute by motorcycle to Columbia University’s school of engineering to pursue his studies further. At Columbia, he came under the influence of the legendary professor-inventor, Michael I. Pupin, who served as a role model for Armstrong and became an effective promoter of the young inventor. In his junior year at Columbia, Armstrong made his first, most seminal invention. Among the devices investigated for better wireless reception was the then little understood, largely unused Audion, or three-element vacuum tube, invented in 1906 by Lee De Forest, a pioneer in the development of wireless telegraphy and television. Audion is an elementary form of radio tube developed in 1906 (patented 1907) by Lee De Forest of the United States. It was the first vacuum tube in which a control grid as well as a cathode and an anode was incorporated. With the development of multigrid tubes in the 1920s, the generic term audion fell into disuse and was replaced by more descriptive terminology. In the autumn of 1912, Armstrong made exhaustive measurements to find out how the Audion tube worked and devised a circuit, called the regenerative, or feedback, circuit, in which part of the current at the plate was fed back to the grid to strengthen incoming signals. Testing this concept in his turret room in Yonkers, he began getting distant stations so loudly that they could be heard without earphones. He later found that when feedback was pushed to a high level the tube produced rapid oscillations acting as a transmitter and putting out electromagnetic waves. Thus this single circuit yielded not only the first radio amplifier but also the key to the continuous-wave transmitter that is still at the heart of all radio operations. This youthful invention that opened the age of electronics had profound effects on Armstrong’s life. Armstrong filed for a patent on the regenerative circuit in 1913. The patent was issued on October 6, 1914. Drawings shown here are from Armstrong patent #1,113,149, the famous regenerative, or feed-back, patent. Subsequently, regenerative feedback was incorporated into a comprehensive engineering science developed by Harold Black, Harry Nyquist, Hendrik Bode, and others in the period between 1915 and 1940. As a radiowave generator, this circuit is still at the heart of all radio – television broadcasting. Armstrong graduated with a degree in electrical engineering from Columbia University in 1913 and returned to Columbia as an instructor and as assistant to professor Michael Pupin, the notable physicist and inventor and his revered teacher. In 1915 Armstrong presented an influential paper on regenerative amplifiers and oscillators to the Institute of Radio Engineers (IRE). The picture at left shows front and back of a Western Electric Engineering Department building pass issued to Armstrong before World War One. With his growing reputation among the radio community, and his many professional contacts at The Institute of Radio Engineers and The Radio Club of America, he must have been a frequent visitor to labs such as this one. Before his new circuit could gain wide use, however, awaiting improvements in the vacuum tube, the United States was plunged into World War I and Armstrong was commissioned as an officer in the U.S. Army Signal Corps and sent to Paris. It was late October of 1917, on his way to France, that Armstrong first met another man who would remain a lifelong friend. This man was Captain H.J. Round, an engineer with the British Marconi Company. It was this meeting that would set the stage for Armstrong’s work on his superheterodyne circuit. One of the tough problems facing the Allies was the reception of signals in the very high frequency range of 500,000 to 3,500,000 cycles. It was suspected that the Germans were using these high frequencies to keep their signals out of tuning range of Allied intelligence. Armstrong learned that the British were far ahead of the Americans in the development of vacuum tubes suitable for such high frequencies, and that Round had devised a method, using tubes of his own design, to receive at frequencies of up to 1,200,000 cycles. Armstrong was assigned to detect possibly inaudible shortwave enemy communications and thereby created his second major invention. Adapting a technique called heterodyning found in early wireless, but little used, in 1918 he designed a complex eight-tube receiver that in tests from the Eiffel Tower amplified weak signals to a degree previously unknown. He called this the superheterodyne circuit, and although it detected no secret enemy transmissions, it is today the basic circuit used in 98 percent of all radio and television receivers. Armstrong played a key role in the commercialization of this invention during the early 1920’s. The Radio Corporation of America (RCA) used his superheterodyne patent to monopolize the market for this type of receiver until 1930. The superheterodyne eventually extended its domain fat beyond commercial broadcast receivers and, for example, proved ideal for microwave radar receivers developed during World War II. By the date of this drawing, R&I Division personnel have been putting a great deal of time into Armstrong’s superheterodyne prototype. Pressley, McDonald, Lewis and Houck, known to be involved in the superheterodyne, may have generated this paper as part of that work. Superheterodyne reception is the commonest technique for recovering the information (sound or picture) from carrier waves of a range of frequencies, transmitted by different broadcasting stations. The circuitry combines the high-frequency current produced by the incoming wave with a low-frequency current produced in the receiver, giving a beat (or heterodyne) frequency that is the difference between the original combining frequencies. This different frequency, called the intermediate frequency (IF), is beyond the audible range (hence the original term, supersonic heterodyne reception); it can be amplified with higher gain and selectivity than can the initial higher frequency. The IF signal, retaining modulation to the same degree as the original carrier, enters a detector from which the desired audio or other output signal is obtained. The receiver is tuned to different broadcast frequencies by adjusting the frequency of the current used to combine with the carrier waves. This arrangement is employed in most radio, television, and radar receivers. The First World War would define a period in Armstrong’s life that would never be equaled. He was free from the prewar patent litigation that was just beginning and would haunt him after the war and for the rest of his life. He would make acquaintances that would remain loyal friends and associates for life. He would develop one of his greatest inventions, the superheterodyne circuit. He would be known worldwide as ‘Major Armstrong’ for the rest of his life and beyond. Armstrong returned to Columbia University with the rank of major and the ribbon of France’s Legion of Honor. By then, wireless was ready to erupt into radio broadcasting. By 1923 the nation had gone broadcast crazy. In 1922 there had been 100,000 radio receivers produced, by 1923 that number stood at 500,000. In 1922 there were 30 radio stations on the air, by 1923 there were 556 on the air. It would be no exaggeration to say that the inventions of Armstrong were in a big way responsible for this enormous growth. In 1920, on a bid from Westinghouse Electric and Manufacturing Company, Armstrong sold rights to his two major circuits for $335,000.00. Later he sold a lesser invention, the superregenerative circuit, to the newly organized Radio Corporation of America (RCA) for a large block of stock. Upon the success of early radio broadcasting, he became a millionaire, but he continued at Columbia University as a professor and eventual successor to Pupin. After a celebratory trip to Paris, he returned to court Marion MacInnes, secretary to the president of RCA, David Sarnoff. On December 1, 1923 they were married. The picture shows their honeymooning in Palm Beach in 1923. Armstrong’s wedding present to his wife was the first portable radio. As the 1920’s wore on, Armstrong found himself enmeshed in a corporate war to control radio patents. His basic feed-back (regenerative) receiver patent had been issued on October 6, 1914. Nearly a year later De Forest filed for a patent on the same invention, which he sold with all audion rights to the American Telephone and Telegraph Company (AT&T). As radio began to boom, AT&T mounted a broad attack to overturn Armstrong’s patent in favor of De Forest’s. The battle went through a dozen courts between 1922 and 1934. Armstrong, backed by Westinghouse and RCA, won the first round, lost a second, was stalemated in a third, and finally, in a last-ditch stand before the Supreme Court, lost again through a judicial misunderstanding of the technical facts. The technical fraternity refused to accept the final verdict. The Institute of Radio Engineers, which in 1918 had awarded Armstrong its first Medal of Honor for the invention, refused in a dramatic meeting to take back the medal. And the action was reaffirmed in 1941 when the Franklin Institute, weighing all the evidence, gave Armstrong the highest honor in U.S. science, the Franklin Medal. Throughout this ordeal Armstrong doggedly continued to pursue his research. He had early set out to eliminate the last big problems of radio — static. Radio then carried the sound patterns by varying, or modulating, the amplitude (power) of its carrier wave at a fixed frequency (wavelength) — a system easily and noisily broken into by such amplitude phenomena as electrical storms. By the late 1920’s Armstrong had decided that the only solution was to design an entirely new system, in which the carrier-wave frequency would be modulated, while its amplitude was held constant. Undeterred by current opinion — which held that this method was useless for communications — Armstrong in 1933 brought forth a wide-baand frequency modulation (FM) system that in field tests gave clear reception through the most violent storms and, as a dividend, offered the highest fidelity sound yet heard in radio. In frequency modulation (FM), unlike AM, the amplitude of the carrier is kept constant, but its frequency is altered in accordance with variations in the audio signal being sent. This form of modulation was developed by the American electrical engineer Edwin H. Armstrong during the early 1930s in an effort to overcome interference and noise that affect AM radio reception. FM is less susceptible than is AM to certain kinds of interference, such as that caused by thunderstorms as well as random electrical currents from machinery and other related sources. These noise-producing signals affect the amplitude of a radio wave but not its frequency, and so an FM signal remains virtually unchanged. FM is better adapted than is AM to the transmission of stereophonic sound, audio signals for television programs, and long – distance telephone calls by microwave radiio relay. Commercial FM broadcasting stations are assigned higher frequencies than are AM stations. The assigned frequencies, spaced 200 kHz apart, range from 88 to 108 MHz. RCA, having missed the opportunity to purchase Armstrong’s feed-back and superheterodyne patents, and having to later pay Westinghouse dearly for them, would not miss FM invention. On June 30, 1922, RCA paid Armstrong $200,000.00 plus 60,000 shares of RCA stock (then worth $217,500.00). The deal included giving RCA first right of refusal on any future inventions. In accordance with his agreement to give RCA first right of refusal on future inventions, Armstrong demonstrated his wide band FM system, at Columbia University, to Sarnoff and RCA engineers in late 1933 and early 1934. The quality was very good, but actual field testing would be necessary to convince the more skeptical engineers, and Sarnoff, that the system could work. To say Sarnoff was impressed would be an understatement. Sarnoff saw this as the receiver which would guarantee RCA sales leadership and stop ‘encroachment’ of its market share by the likes of Atwater Kent. Also weighing heavily on his mind was the fact that AT&T, a potential competitor in receiver manufacturing, had recently submitted a superheterodyne to RCA for evaluation. In fact, Sarnoff and the RCA board of directors were so impressed with Armstrong’s equipment that the million dollar orders placed just two days before, to Westinghouse and GE, to cover the ‘23 – ‘24 Christmas season, were canceled. Sarnoff’s plan was to scoop the following season. They did – the superheterodyne introduced in Februaryy of 1924 was a runaway success. In 1931, NBC, the broadcasting arm of RCA, had installed a television transmitter on the 85th floor of the Empire State Building to conduct experiments with that new medium. By early January of 1934, RCA, not yet ready to start television testing, had placed the transmitter at Armstrong’s disposal to conduct large scale field tests of his FM system. The three electronic instruments show here include: the Signal Corps set built in France (left), the pre-production 2nd harmonic superhet (center) and the production 2nd harmonic superhet, the 1924 Radiola AR-812 (right). RCA Radiola AR-812 was the first production superheterodyne radio receiver. It’s commercial development was spurred on by the Radio Corporation of America in 1923. Prior to 1930, all RCA receivers were manufactured by either General Electric or Westinghouse and except for the do-it-yourself kit market, RCA refused to licence the superheterodyne to other manufacturers until after 1930. On November 5, 1935, before the New York section of the Institute of Radio Engineers, Armstrong presented his paper “A Method of Reducing Disturbances in Radio Signaling by a System of Frequency Modulation” – his FM system was thus disclosed to the radio engineering community. The presentation was accompanied by a demonstration of FM’s capability by receiving a transmission from Randy Runyon’s amateur station (WQAG) transmitting from Yonkers. While the demonstration was a complete success, the engineering community, in general, was not enthusiastic. Because the new system required a basic change in transmitters and receivers, it was not embraced with any alacrity by the established radio industry. Armstrong had to build the first full-scale FM station himself in 1939 at a cost of more than $300,000 to prove its worth. The Radio Club of America, and the radio men who made up its membership, thought so much of Armstrong’s contributions to the radio art that an annual “Armstrong Medal” award was initiated in 1937. The first award was presented to Prof. Hazeltine by club president John Miller (left to right – Armstrong, Hazeltine, Miller, Sandenwater, Burghard). For Armstrong, the Second World War started in 1939, when the Signal Corps came to him for advice on adapting FM to mobile military communications. Through 1940 and 1941 he was proud to undertake a number of projects for the Signal Corps at no cost. He received the Medal of Merit for his contributions. Armstrong’s fortunes would soon change – with the cessation of all FM station construction, and a halt to all radio manufacturing, except for the war effort, royalty payments dried up – and so did his income. Armstrong had spent over $1,000,000.00 on FM, but had received less than $500,000.00 from royalties thus far. In order to support his laboratories at Columbia and Alpine (with personnel now numbering 18), Armstrong took on a number of cost plus fee projects for the military. His primary contribution, although not completed by the end of hostilities, was a complete FM radar system capable of very long range detection. In 1945 Armstrong was dealt a blow by the FCC – FM would have to move from the established 44 – 50 megacycle pre-war band to a new band at 88 – 108 megacycles, to make way for televisionn. More than half a million FM receivers and some 50 transmitting stations would be rendered obsolete. But the worse fear for Armstrong would be a loss of confidence in FM by the growing number of faithful hi-fi listeners. This move to higher frequencies, however, proved to be only a temporary setback for FM. By 1950 there were over 600 FM stations on the air and Armstrong had collected close to $2,000,000.00 in FM receiver royalties. The problem, though, was the personal cost of keeping his Alpine station on the air – and funding his research and staff. The money was leaving as quickly as it came in. The fact was that many companies were paying FM royalties (G.E., Westinghouse, Zenith and Stromberg-Carlson, to name a few), but R.C.A. and its licensees were not. Armstrong needed that income to continue his independent research and remain free of corporate control. On July 22, 1948, Armstrong instituted a suit against R.C.A. and N.B.C. charging them with infringing his five basic FM patents. This suit would virtually dominate his life – and in fact would outlast him. In November of 1953 it must have seemed to Armstrong that the world was closing in on him. Armstrong struck his wife when she refused to give him some money he had given her earlier. Marion, his wife of 31 years, could not cope with this final war in the courts and his worsening personality, she left him for her sisters home in Connecticut. It was only later realized what dreadful condition his finances were in – he was facing a real catastrophe. Facing a long legal battle, ill and nearly drained of his resources, Armstrong committed suicide on the night of January 31, 1954, by jumping from the window of his thirteenth-floor apartment in New York’s River House. After his death, his widow, Marion, set out to finish what he had started. She continued the lawsuits, sitting in the courtroom each day following the arguments and watching as testimony was given. Her first victory, over RCA in 1954, gave her funds to continue the other suits. In 1967, with the victory over Motorola, she had won all twenty-one and established clearly and decisively that Edwin Howard Armstrong was the inventor of frequency modulation. Ultimately his widow won $10 millions in damages. By the late 1960’s, FM was clearly established as the superior system. Nearly 2,000 FM stations spread across the country, a majority of all radio sets sold are FM, all microwave relay links are FM, and FM is the accepted system in all space communications. Armstrong was posthumously elected to the roster of electrical “greats” to stand beside such figures as Alexander Graham Bell, Marconi, and Pupin, by the International Telecommunications Union in Geneva. He was the great prose master of electronic circuitry, weaving its phrases and components into magical new forms and meanings. He was inducted into the National Inventors Hall of Fame in 1980. View the full website biography of Edwin H. Armstrong.